When Thirumangai Alwar came here to see and get the seva of the Perumal, he didnt notice him, as the Perumal was talking with Periya Pirattiyaar. Getting angry on him, Thirumangai Alwar just worshipped him without doing Mangalasasanam. From there he came to Thirukadal Malai (Mahabalipuram) he worshipped Kadalmalai perumal and did Mangalasasanam on Thirundraoor perumal Pattharavipperumal of Thirunindraoor. The basic principle of worshipping the God is both Perumal and Thaayar has to be worshipped all along the way. No one should be left out. If Sriman Narayanan is the God who protects all the human of the world, then it is periya pirattiyar who recommends for the people to take of them to Sriman Narayanan. Worshipping only Perumal and leaving Pirattiyaar is said to be the worship of Sooranaga (Sister of Ravana) and worshipping only Pirattiyaar and leaving Perumal is said to be the worship of Ravana. Both these worship are not 100% pure and it is basically due to jealous and anger. But it is said that once Ravana wanted to get Siva Peruman's wife Parashakthi and then he wanted to get Sri Vishnu's wife Sita Piratti. But, in Rama Avathaar, Sri Ramar treated Vibeeshana as his brother there by making both Ravana and Soorpanaka as his brother and sister. Both the love of Ravana on Parasakthi and the love of Soorpanaka on Rama is one of the way of love, they want to express. This sthalam is under the control of Periya Jeeyar of Tirupathi - Tirumala. Theertham - Varuna Pushkarini, Viruthasheera river. 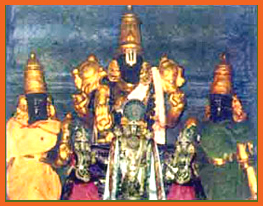 The Moolavar of this sthalam is Sri Bhatavatsala Perumal. Also known as "Bhatharavippermal". Moolavar in standing position facing east direction. Prathyaksham for Varunan (the Rain God). This Divyadesam is situated in Tamil Nadu District. One mile away from Thinnanoor railway station which is on the railway lane between Chennai to Arakkonam. Bus facility available from Chennai - Poonamalle and Thiruvallore.